In second win in a month, judges praise immersive experience tech, science and arts event for underserved youngsters as "an inspiring example of collaboration" and "truly innovative"
Middlesex University staff have lifted an Outstanding Contribution to the Local Community prize at the Times Higher Education Awards - widely referred to as the "Oscars of higher education" - at a ceremony at Grosvenor House Hotel on 29th November. The award is for the community engagement event SMASHFestUK, which Middlesex set up and runs with Greenwich University in collaboration with TV production company The Refinery, with the aim of inspiring interest and increasing diversity in STEAM - science, technology, engineering, mathematics and the arts. The annual event, offering interactive workshops, games, installations and performances joined by the common thread of a disaster narrative, was piloted in Deptford in 2015, then rolled out as a national festival. Each year the focus is a different natural disaster - Supervolcano, ASTEROID!, SOLAR STORM!, and in 2018, FLOOD!, with the help of researchers from Middlesex’s Flood Hazard Research Centre - exploring what impact the event would have, how to survive it and how to rebuild society afterwards. Academic staff, students and outside experts supervise and help young people explore scientific concepts. SMASHFestUK seeks to work in particular with young people from ethnic minority communities and from backgrounds with multiple poverty indicators, as well as young women: groups often underserved by STEAM provision. With an inclusive approach built into the festival, project leaders have built an audience which is more than 70 per cent black or mixed heritage among under-16s taking part, and 62 per cent female. The judges described SMASHfestUK as “an inspiring example of collaboration between educational organisations and communities that has become a national programme in just two years. "Immersive experiences have been used to encourage young people to engage with practical solutions to disaster scenarios, a truly innovative way of stimulating interest in STEM and arts subjects, as well as ecological issues, while also reaching out to the wider community,” they said. Times Higher Education editor John Gill said: “At a time when universities face challenges and headwinds, it is particularly important to champion the values, creativity and dedication of those who live and breathe higher education. 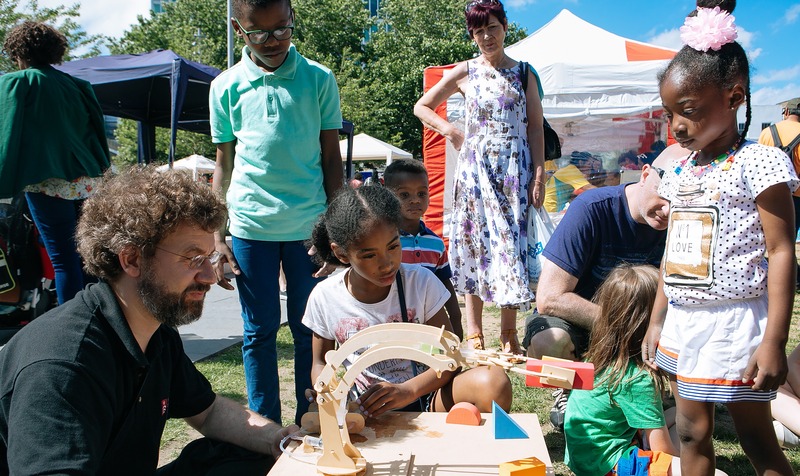 Dr Mark Gray, Pro Vice Chancellor and Director of Knowledge Transfer at Middlesex University said: "I’ve been in awe of the energy, inventiveness and ambition of the SMASHfest team for some time. Projects like this take time, patience and a lot of dedication – often out of work time. "The success of SMASHfest demonstrates how community engagement can support our mission as a university to effect social change. As I know personally from others in the sector, it’s a model that’s widely admired." Executive Dean for the Faculty of Science and Technology at Middlesex Professor Martin Loomes said, "We supported this project from the outset for two reasons. Engaging people in STEAM within their communities is fundamental to our University mission and values. Perhaps more important, however, is that the energy and enjoyment we get from engaging with young people, their families and their teachers feeds back into everything we do." This is SMASHfestUK's second national award this month: three weeks ago it won a Young Innovator - Engagement Initiative prize at The Engineer magazine's awards, having triumphed in the same category in 2017. In 2016, the festival received an award for inventive outreach work from the National Co-ordinating Centre for Public Engagement (NCCPE), the higher education sector’s leading agency for social and community engagement.